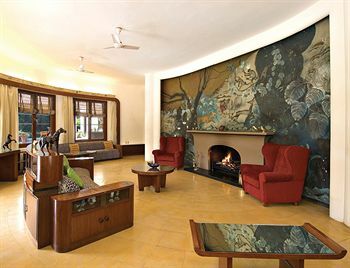 Vivanta by Taj Sawai Madhopur lodge is best luxury option to stay in Ranthambore Tiger Reserve. The Lodge is approx 2 km from the Sawai Madhopur railway station. Originally Sawai Madhopur Lodge was built more than eighty years ago by the Maharaja Sawai Man Singh II of Jaipur and it was the hunting lodge of the Maharaj of Jaipur and often Royal family camped here. It is the only one of the resorts in Ranthambore which has got a heritage position and offers comfortable accommodation for guests during their stay in Taj lodge. The hotel has extensive soulful garden area that includes charming lawns and luxury cottages. Houses, Dining hall and lounge are still have original art style and decoration of past but later on the veranda also added with its splendid style. The lodge is fully loaded with all necessary modern facilities for your pleasant stay. You can walk around through paths across 12 acre the lush green gardens. Taj sawai Madhopur Lodge offers comfortable accommodation across Superior Charm, Deluxe Allure Suite and Premium Temptation Suite with air- conditioned, hygienic and highly clean.Each room of lodge have complete feature of amenities include Satellite TV, Electronic safe , hot and cold running water etc and in house facilities are swimming pool, fitness center , spa ,library ,Internet access and complimentary newspaper. The team of Sawai Madhopur Lodge provides world class and highly professional service to clients on every step. The lodge offers continental, Indian and Chinese cuisines. You can have either your dinner or lunch on open top roof terrace, that is used sometime for cocktail parties and corporate. Dining Room-Enjoy excellent Indian and Continental cuisine all day. Use of pool and fitness centre.